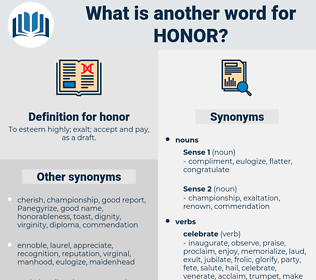 What is another word for honor? To esteem highly; exalt; accept and pay, as a draft. commemorates, recognizes, celebrates, fulfils, meets. respects, transmit, fulfill, celebrate, uphold, upholding, abide, commend, adhere, discharge, recognize, perform. privilege, honorary, pleasure, distinction, reputation, dignity, lordship, commemoration. indecency, immorality, dishonesty, impurity, evil. derision, criticism, disrespect, denunciation, humiliation, blame, disclaimer, censure, ignorance, disobedience, depression, condemnation, neglect, ill repute, stigma, unimportance, heedlessness, disdain, disbelief, Lowliness, disregard, doubt, reproach, distrust, disgrace. wretchedness, burden, roguishness, blameworthiness, scorn, blemish, criminality, debasement, contemn, abhor, decadence, mess, hate, dissipatedness, degeneracy, baseness, corruptibility, disgracefulness, disreputableness, dissoluteness, execrate, dissipation, detest, abominate, perversion, obligation, villainy, meanness, crookedness, degradation, sinfulness, fright, ridicule, rottenness, corruptness, vileness, horror, duty, attaint, venality, responsibility, eyesore, looseness, reprehensibleness, unscrupulousness, wickedness, knavery, dislike, pervertedness, shamelessness, defect, lowness, despise, rascality. criticize, forget, castigate, condemn, humiliate, mock, insult, debase, betray, shame, denounce, ignore, belittle, lower, degrade, overlook. No woman, other than I, had ever had that honor before. I bear a letter, said Walter Butler, and have this morning done myself the honor of waiting upon Lady Coleville and the 'Hon. wassail, toast, dignify, salute, decorate, pledge, ennoble, drink.